So I downloaded it and tried it out, and found that there are some gotchas. Nothing show-stopping yet, but some things that it would’ve been really nice to know about before I started. So I’ll share. As of today, NUnitLite has not shipped any releases. So you’ll have to download the latest code from the NUnitLite source repository. You can download any changeset, but you probably want the latest (the topmost row in the grid — changeset 11989 when I downloaded). Click the disk icon in the left column to download a ZIP. 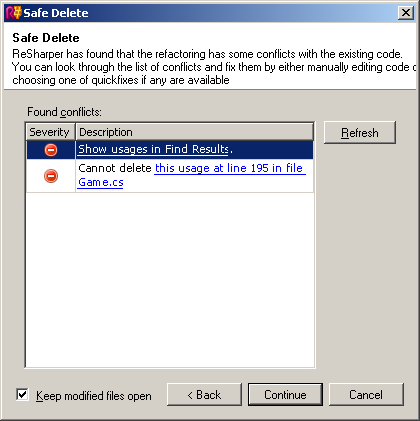 There’s a solution file in NUnitLite\src, but don’t bother opening it. It contains tests for NUnitLite itself, and those tests are NUnit tests — so they won’t even compile unless NUnit is wherever they expect it to be. Out of the box, NUnitLite doesn’t return a nonzero exit code when tests fail. This makes it completely worthless for any kind of automation. What good are unit tests if they don’t fail the automated build? Fortunately, this is pretty easy to get around. You can do either of two things: modify the NUnitLite source code, or run the test-runner object yourself. I chose the latter, for now. See below for some code you can put in your program’s Main() method to run NUnitLite properly, including return of a nonzero exit code when tests fail. As with most test frameworks, you define “test fixture” classes and put test methods on them. Setup and teardown are supported. You can choose to make your test-fixture classes descend from the NUnitLite.Framework.TestCase class. This doesn’t seem to gain you much, though, and TestCase doesn’t have a default constructor, so you’d have to add an explicit constructor to your test fixture. Personally, I don’t bother descending from TestCase. Test fixtures: Your test fixture must have the [TestFixture] attribute, whether or not it descends from TestCase. There’s no restriction on the class’s visibility, although I always make them public out of habit. SetUp and TearDown: If you’re descending from TestCase, you can just override the SetUp and TearDown methods. Otherwise, make a method and tag it with the [SetUp] or [TearDown] attribute. Assertions: In addition to the uber-cool Assert.That() assertions, NUnitLite also supports the old NUnit-style Assert.AreEqual() assertions. Create a new console application. Replace its Main() method with either of the following blocks of code. Make sure that you’ve added the NUnitLite project to your solution. 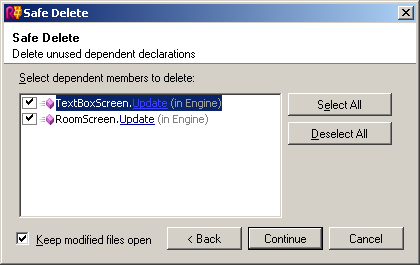 Then in your new console application, add a reference to NUnitLite (using the Projects tab of the Add Reference dialog). Also add a reference to the project containing the code you want to test. Then you need to write the Main() method that starts up your app and runs the tests. I’ll present two different code blocks that both accomplish this; choose the one that suits your needs. Make sure you used the “Automatable” Main() method (see above). In Solution Explorer, right-click on your project, and go to Properties. Go to the “Build Events” tab. In the “Post-build event command line” box, type the name of your test EXE. In my case, my project is called Tyler.Tests.csproj, so I just type Tyler.Tests for my post-build event. Save everything and build. Now, every time you build your test project, your test project will automatically run, and if it returns a nonzero exit code, Visual Studio will show “The command ‘Tyler.Tests’ exited with code 1” in the Error List window. Then you can press Ctrl+Alt+O to view the Output window, where you can see the test output, and see which tests failed and with what messages. I know this isn’t relevant to what I normally blog about, but it’s compelling. You’ve probably already heard all the news coverage about the conditions at the Walter Reed Army Medical Center. But most of the coverage so far has been from the media looking for sensationalism, and from brass hats and politicians covering their asses. Here, on the other hand, is an account from a senior chaplain at Walter Reed. The news media and politicians are making it sound like Walter Reed is a terrible place and the staff here has been abusing our brave wounded soldiers; what a bunch of bull! I was in shock when the news broke. We in the chaplains office in Walter Reed, as well as the majority of people at Walter Reed, did not know anyone was in building 18. […] Building 18 is not on the installation of Walter Reed and was believed to be closed years ago by our department. The fact that some leaders in the medical brigade that is in charge of the outpatients put soldiers in there is terrible. I appreciate this guy’s agenda — improving hospital conditions for wounded soldiers — a whole lot more than I appreciate the CYA agenda of the politicos. Go read what he’s got to say. Lua is an open-source scripting language that’s designed to be embedded into larger apps. I know it’s used in World of Warcraft and SciTE. There are examples out there of using Lua from Delphi apps. And through another open-source project, LuaInterface, you can embed Lua scripting into a .NET app, so easily it’s almost silly. // Don't let scripts use the "io" or "debug" packages. // Don't let them call the "dofile" method either. Classes1 and methods are both reference types, and to make them go away, you just need to nil out the global variable that holds the reference. There are only a few dozen of these globals when you spin up Lua, so it’s not hard to go through them and decide which ones are safe for a sandbox and which aren’t. You can even assign .NET objects into Lua variables, and all their methods and properties are instantly callable from Lua. Alas, this is not sandbox-friendly in the shipping version of LuaInterface, because by default, Lua can call private methods on that .NET object! But there’s an easy code change to LuaInterface that fixes this. And Lua has built-in coroutine support. So I can use it for writing cooperative, synchronized scripts for sprite interaction. I’ll definitely be posting more about this. 1 Technically, they’re not classes, they’re “tables”, which are kind of like supercharged associative arrays. There’s some good Lua documentation if you want to know more; I’d recommend starting with Programming in Lua.